Caption slip reads: "Photographer: Lou Mack. Date: 1960-12-12. Assignment: Safe blown up. 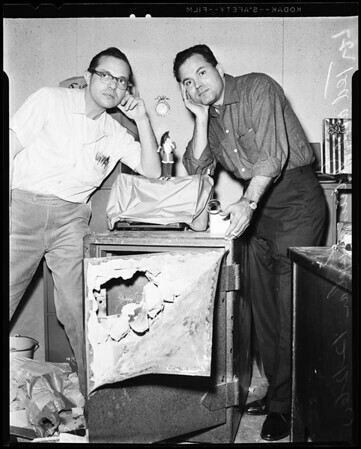 27/28: L/R Ted and Julius Kaplan, owners of 'Ted's' 431 South Broadway pose forlornely, with Santa Claus, on safe which was blown up and robbed of approximately $7,000".